Bettas are popular aquarium fish. Bettas are known for their aggressions, so breeding them is tricky. 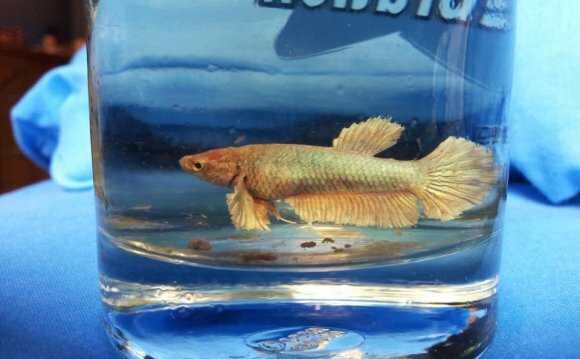 If you want to breed them, you'll have to learn how to recognize a receptive female betta. Fortunately, it's not that difficult, and with a little homework, you can tell when your female betta is ready to spawn. Condition your bettas. Before spawning, you should take better-than-usual care of your fish, giving them extra TLC. This includes things like feeding them live, frozen and freeze-dried foods like chopped earthworms, bloodworms and brine shrimp. Also, keep their bowls especially clean during conditioning. This will prepare them to spawn. Introduce your conditioned fish to each other. A good way to do this is to put a hurricane glass or jar into the tank, and put the female in there. This allows you to see if the female is receptive without directly exposing her to the male until you're sure that she's ready. Observe the female. If she is ready to spawn, you will see several signs. The most obvious is that the female's color will change a little, developing a striped pattern. You will also be able to see the female's ovipostor (an egg-laying organ) between her ventral fins. It will look like a speck of pretzel salt. Also, the female will either flare back at the male (extend all of her fins to look larger) or clamp her fins. Release the female if you see these signs. At this point she is most likely ready to spawn. You should still watch closely, as bettas can be unpredictable. Watch your fish carefully, as some males will try to drive the female away after spawning and may hurt her. Bettas are living things. Not all of them have read this article and may not act the way they're supposed to. Some people are allergic to live and frozen fish foods, particularly blood worms. Watch for signs of an alergic reaction when handling them. Consult a doctor if necessary.